InkJetClean is a revolutionary new product which allows you to clean your Epson print heads without removing them from your printer. What makes this product revolutionary is that the cleaner can be printed just like ink. Each print head nozzle can act as its own pump to push the cleaner through and clean ink deposits to restore print quality. As an added benefit it also flushes your printer’s tubing, filters and dampers from the cartridge right to the capping station. No modification to your printer is necessary to use InkJetClean. It comes in a 300 ml cartridge for Roland, Mutoh and Mimaki eco-solvent and mild solvent printers. It has an ink chip that allows it to be registered by your printer as an ink cartridge. The printer won’t know it’s the cleaner. Cartridges come programmed with the ink type and color which matches your ink set. We have cartridges for all Eco-Solvent and Mild Solvent OEM inks. Just unplug your ink and plug in InkJetClean cartridges and you can start cleaning your print heads. Once the cartridge is installed, do enough ink fills to get the cleaner from the cartridge to the print head. Most printers take from 2 to 5 ink fills for the cleaner to reach the print head. Consult your user manual for more specific information on ink fills and the procedure. 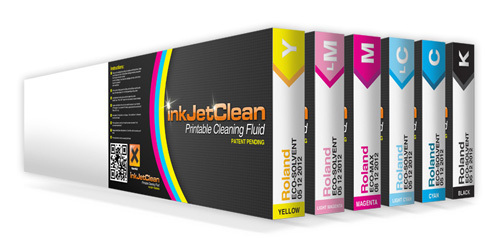 Once the cleaner reaches the print head you can print a solid image of the color you are trying to clean, and InkJetClean will break down the ink and flush it from the print head. InkJetClean is slightly tinted, so you can print a nozzle test to check the nozzles condition. After your print head is clean, just replace the cleaner cartridge with your ink cartridge. Do enough ink fills to get the ink back into the printheads. And that’s it. InkJetClean can be used to recover missing nozzles or as a regular maintenance procedure to clean out your ink system. If you use your printer once in awhile, then plan to use InkJetClean every 3-6 months. If you print every day, then plan for a more frequent use (every 2 months).